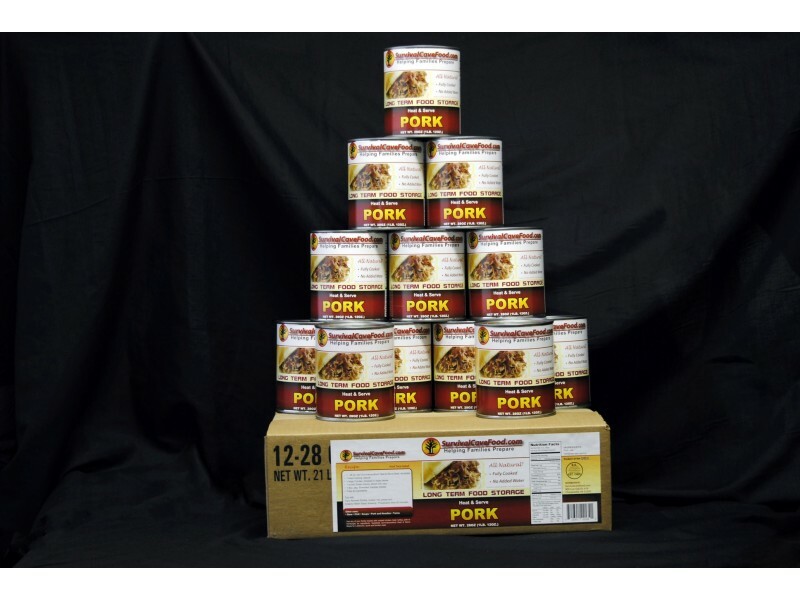 Survival Cave Pork 12 cans is high quality, great tasting cooked pork, ready to eat whenever you need it. Whether you’re preparing for disasters, global economic meltdowns, or just hard times, this is an excellent option. Included in each case is 108 full servings of great tasting pork. You can eat it right out of the can, cook it up, or even use it in almost any recipe. Pork is high in protein and other essential nutrients, making it ideal for keeping you strong and healthy through any situation. 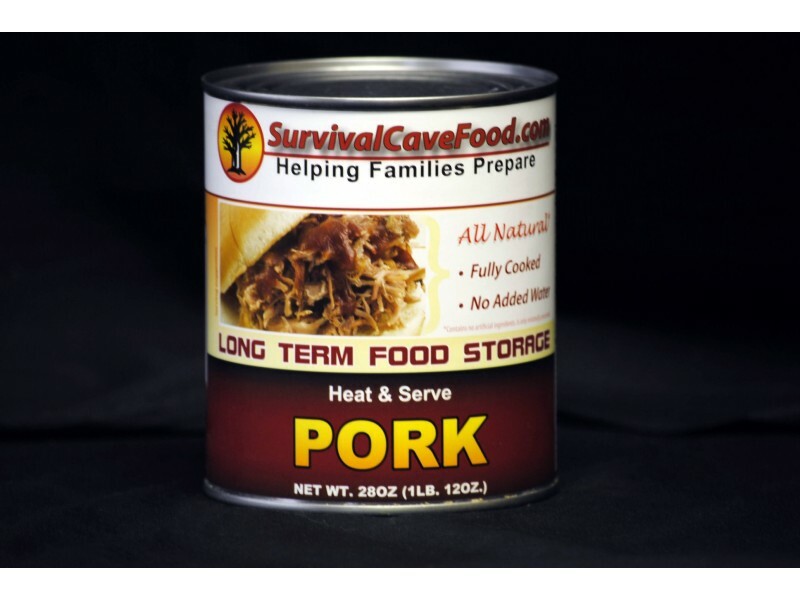 When you buy Survival Cave-Pork, you get 12 cans, each containing 28 ounces of meat. There is no water added, so you’re getting full cans of meat in its own juices. Each can has 9 servings, meaning a total of 108 servings can be enjoyed from a single case purchased. The canned pork has a very long shelf life. It actually has no set expiration date because of the canning and cooking process, which keeps all contaminants out. It will last at least 12-15 years, though many people are confident it can last at least twice that amount of time. Regardless of how long you store the pork, it is easy to prepare and enjoy. Made from USDA inspected meat, Survival Cave-Pork is prepared to present the maximum quantity for each purchase made by a customer. 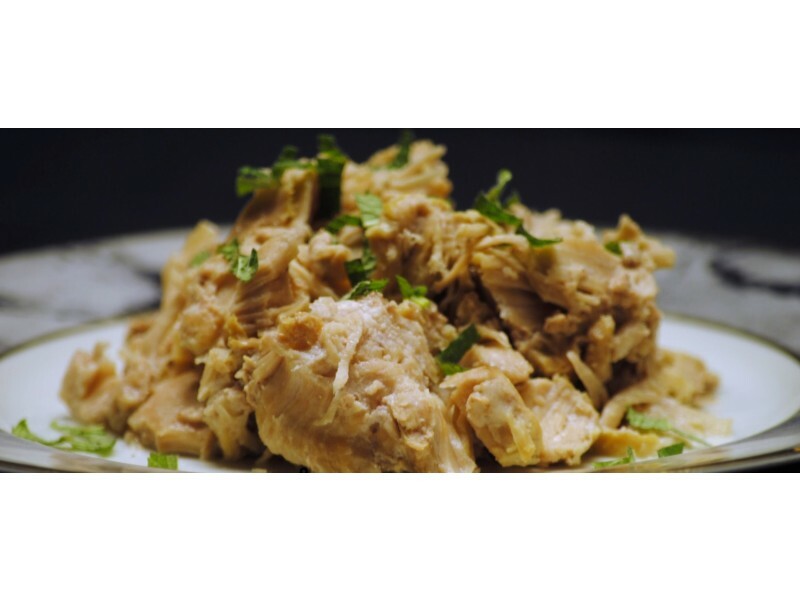 Whether you’re just starting out your food stockpile, or you’re looking to add some variety, this canned pork is an excellent option. You’ll be able to feed yourself and your family with high quality meat for weeks, and much longer if you are able to supplement it with other foods you find, grow or have in your stockpile. No matter what situations you’re faced with, it is always important to make sure you have the food you need to survive, and that is just what this great canned pork will be. You will get a total of 12 cans with 28 ounces inside each and every can, no water or broth added, just the natural juices of the meat. That’s a full 21 pounds of fresh yummy wholesome hand packed and cooked meat and 108 servings. Our canned storage meats are all natural and DO NOT include any MSG, additives, fillers or chemical substances. There're lower salt, low in excess fat and healthy for your family. USDA inspected Survival Cave Food canned meats are only created using 100% USDA inspected meats. Various other canned meats are foreign meats or state they are packaged in the USA although the meat in fact is produced by other countries and are merely packaged in the United States. We only use 100% USA meats! This delightful line of meats is prepared to provide you with the highest possible amount for one's food dollar. They are hand packed and “non mechanically separated meats” and we also NEVER ADD WATER or broth. This makes certain that all you spend money on is meat. Whenever you open up these cans they are simply ready to eat and flavorful in virtually any recipe you would use fresh prepared meat.